The 22-year-old murder suspect in the high-profile disappearance of a Japanese visitor was indicted by an Oahu grand jury yesterday morning. Kirk Matthew Lankford of Kalihi is charged with second-degree murder in the suspected killing of 21-year-old Masumi Watanabe, who has been missing since April 12. Circuit Judge Derrick Chan confirmed Lankford's bail of $1 million. Deputy Prosecutor Vickie Kapp said Lankford could pose a flight risk because he is from the mainland. 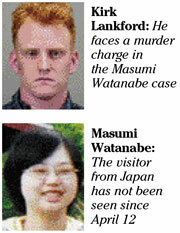 Watanabe's body has yet to be found, as police continued the search in Windward and northern areas of Oahu yesterday. Lankford either killed Watanabe or, knowing she had serious injuries, failed to obtain aid from law enforcement or medical attention, the indictment alleges. Without a body, prosecutors must rely on circumstantial evidence, which includes blood and glasses found in Lankford's company vehicle, and witness testimony that Watanabe entered the truck. One witness saw Lankford digging a hole at Kahana Bay. Lankford, arrested last Thursday, was a technician at Hauoli Termite and Pest Control and was in Pupukea for work on the morning of Watanabe's disappearance. An arraignment date has yet to be set. Lankford's attorney, Don Wilkerson, has said Lankford claims innocence. The case, which began as a missing-person report and a CrimeStoppers bulletin, has caught the attention of Japanese media. Since then the Honolulu Police Department and city prosecutors have held separate news conferences unusual in their timing -- one at night and another during the weekend. City Prosecutor Peter Carlisle said the news conferences served to ensure that "everybody who has a stake in this ... knows exactly what's going on, what we're doing, how we're doing it and why we're doing it." "I feel we owe that not only to the people of the state of Hawaii, but also the country of origin of Masumi Watanabe," Carlisle said.